Angus McIntosh was the first Forbes Professor of English Language and General Linguistics at Edinburgh University. Appointed in 1948, he was to spend the rest of his academic career in that post, 31 years, in which he created and led probably the strongest department of English Language found anywhere in the world. It was an unusual length of service in so senior a position, but the impact that he had on the University and the subject was also due to an unsurpassed mix of determination, charm and wit, intellect and vision, scholarship and innovation, and an academic environment which enabled him to make things happen. Angus was born to Scottish parents near Sunderland, County Durham. He was educated at Ryhope Grammar School, then at Oriel College Oxford where in 1934 he graduated with First Class Honours in English Language and Literature. As Harmsworth scholar he went on to a diploma in comparative philology at Merton College, where he is said one day to have thrashed JRR Tolkien at tennis, confining him to his rooms with an ankle injury. Thus marooned, with nothing better to do, Tolkien started sketching out ideas for The Hobbit and The Lord of the Rings, works for which Angus would later cheerfully accept blame. Angus spent 1936 to 1938 at Harvard as a Commonwealth Fellow. A lectureship in the Department of English, University College Swansea, was to follow on his return to Britain. The war interrupted his academic career, though not his intellectual development. A brief spell as trooper in the Tank Corps was followed by service as a major in Military Intelligence. The latter was to have a lasting effect on his career; and his most significant posting was Bletchley. Here, with many of his university peers turned cryptographers and translators, he played his part in decrypting the German military communication and breaking the Enigma codes. Against his backdrop of philological training he witnessed the beginnings of modern computing. Faced with numbers, an essentially qualitative research instinct began to foresee the potential of computers as a tool for linguistic analysis. Bletchley was to influence profoundly his thinking about empirical research questions in the history of English: eventually it would shape his entire approach to his subject. At war’s end, from Badgastein in Austria, he managed almost single-handedly to thwart the flight of a Japanese delegation from Nazi Germany. He then returned to academe and a lectureship at Christ Church Oxford was followed, in 1948, by his appointment at Edinburgh. He was to be buoyed by and actively involved in a particularly stimulating and innovative period in the history of Edinburgh’s Arts Faculty. He was the prime mover in the founding of the School of Epistemics (now School of Informatics), of the School of Scottish Studies (now the Subject Area of Celtic and Scottish Studies within the School of Literatures, Languages and Cultures), and of the then separate Departments of Linguistics and Applied Linguistics. He was also behind two major dictionary projects and the Linguistic Survey of Scotland. Indeed it was while assessing returns from the questionnaire for the Linguistic Survey of Scotland that Angus began to see the possibility of applying the methodology of modern dialect surveys to the investigation of past stages of the language. Middle English in its written forms exhibited high degrees of linguistic variation, known broadly to correlate with England’s geographical regions. Experimenting with the Linguistic Survey data, Angus attempted to localise material from informants purely on the evidence of their written linguistic forms. The method Angus devised with his collaborators Michael Samuels and Michael Benskin, in what later became the Middle English Dialect Project, was to be known in the trade as the Fit Technique, essentially an application of the principles of set theory to geographical distributions. It was to revolutionize dialect research in historical linguistics. A Linguistic Atlas of Late Mediæval English (LALME) was published in 1986, thirty-four years after its inception, and enthusiastically received in the scholarly community. LALME led the advent of variationist methodology in the study of the linguistic history. The work now has its place beside other large-scale, essential reference works such as the Middle English Dictionary and indeed the Oxford English Dictionary. Angus’s pioneering work for the Linguistic Survey of Scotland resulted in the publication in 1952 of his Introduction to a Survey of Scottish Dialects. In the same year he set up the Joint Council for the Scottish Dictionaries. A tireless supporter of both the Scottish National Dictionary and the Dictionary of the Older Scottish Tongue (DOST), Angus masterminded the long-term funding not only for DOST but also for LALME and the Arts and Humanities Research Council-funded Institute for Historical Dialectology, successor to the Middle English Dialect Project and, in 2013, proudly re-named The Angus McIntosh Centre for Historical Linguistics. Almost as though to mark the year of Angus’s death, the Departments of English Language and of Linguistics, both founded by him, were merged in 2005 into a single Subject Area within the School of Philosophy, Psychology and Language Sciences. This development too may ultimately be traced back to him: from its early days, the discipline of English Language at Edinburgh has been of a unique brand, defining itself within the context of current linguistic theory rather than that of medieval literature, the subjects’ then more traditional orientation. Needless to say, what was Angus’s innovation half a century ago is now the mainstream of a thriving subject. 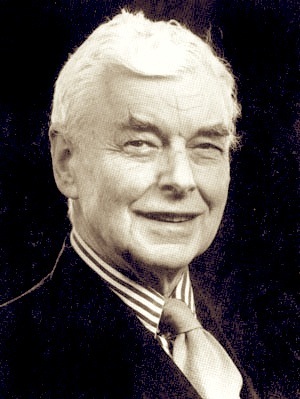 From 1977 to 1989, Angus was president of the Scottish Text Society – and later honorary president – and for many years he was a member of the Early English Text Society’s council. Between 1989 and 1994, he was joint chairman of the editorial board of the massive Encyclopedia of Language and Linguistics. Among his honours was membership of the Finnish Academy of Science and Letters, and he was a fellow of the British Academy and of the Royal Society of Edinburgh. In 1989 he received the British Academy’s Sir Israel Gollancz Prize. He had honorary doctorates from the universities of Poznan, Durham, Glasgow and Edinburgh. His standing in the subject was as huge as was his impact on it. Angus married Barbara Bainbridge, a New Englander, in 1939. They had two sons and a daughter, and 11 grandchildren. After Barbara’s death in 1988 Angus married Karina Williamson. 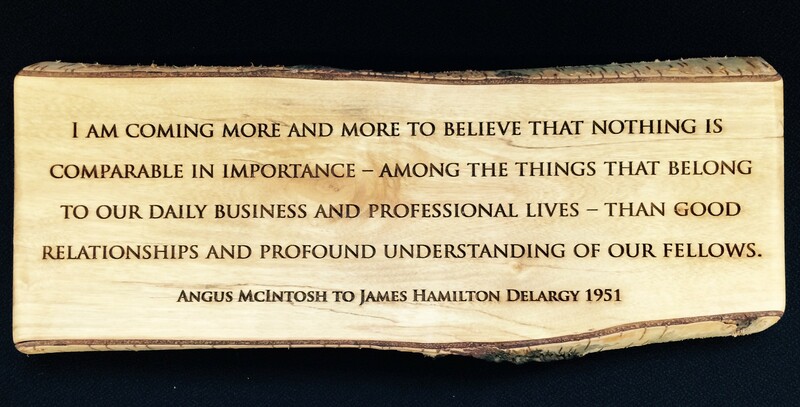 Angus McIntosh, scholar, born January 10 1914, died October 26 2005.
and an honorary member of the Centre. Find out more about the plaque here.